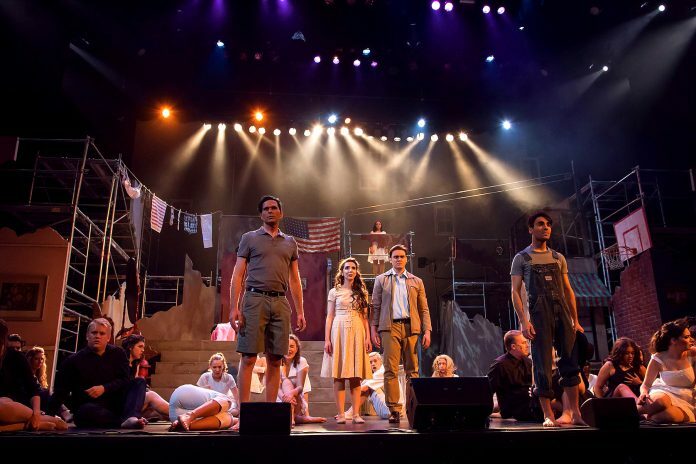 West Side Story, a recent production by Brampton Music Theatre. At a Brampton Committee of Council meeting this week, several arts groups presented delegations to ask the City to give support to the arts community. 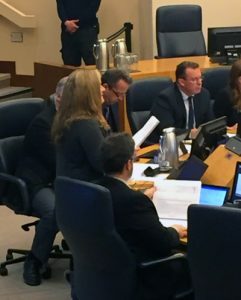 Sharon Vandrish, the President of Brampton Music Theatre (BMT), appeared before the committee on Wednesday, asking the City to reconsider its plan to sell a building that is currently being used by several arts groups. The building, located on Orenda Road, has been identified by staff as surplus to the City’s needs, and the theatre group has been asked to vacate the building before June. The theatre company leases a portion of the building at a subsidized rate, and uses the space to conduct its rehearsal operations five nights a week, as well as to build the set pieces that it needs to put on its increasingly popular stage performances. 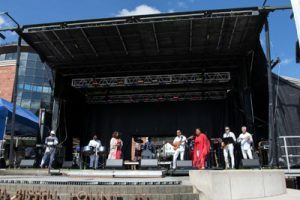 “We are here to ask the City to partner, promote and facilitate one of the most successful, self-sufficient, non-profit arts groups in Brampton, which is in alignment with the proposed Cultural Master Plan.” Vandrish stated, referring to an expected master plan that the city’s planners are currently preparing for Council’s consideration. Vandrish, a mainstay of the Brampton arts community, leads the theatre company which has been in operation since 1963. 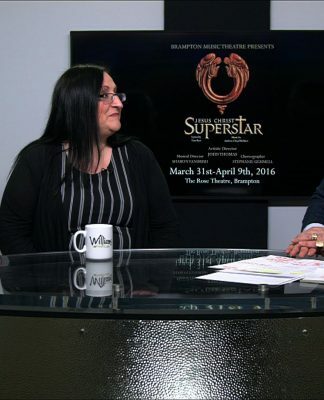 She says that the theatre company is financially successful, and is responsible for attracting 25 per cent of the total attendance currently seen at the Rose Theatre. 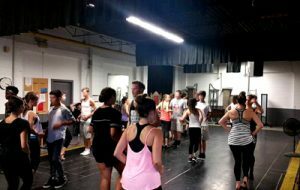 While BMT’s primary concern was for the continuation of the rehearsal space, it is also facing cutbacks to their scheduled two-week runs at the Rose Theatre. The City has cut their time allotment to one week, and this, Vandrish says, will cripple the company’s financial viability. “Why are we playing with this successful formula? Brampton Music Theatre is a sure thing. We are guaranteed patronage, and new patrons come from all around because each cast has a different set of members.” According to numbers from the City, the Rose Theatre sees a total attendance in a year of 55,000, with BMT responsible for 14,000 patrons to the downtown venue. The theatre company contributes over $100,000 to the City in rents paid to both the Rose Theatre, as well as to the Lester B. Pearson Theatre, where the company showcases its Youth Troupe performances, which give an opportunity for students to participate in theatre productions. The Lester B. Pearson Theatre is undergoing renovations this year, and without a plan to relocate to the Rose Theatre, the Youth Troupe performances are also facing an existential challenge. On average, the Youth Troupe supports arts training to over one hundred kids, and in cutting back its support of BMT with potentially shorter theatre runs or higher venue fees, Vandrish believes that students will have less opportunities in the city. In a second, spirited, delegation presented by Carmen Spada, the Artistic Director of B-Jazzed, a group responsible for the inaugural World of Jazz Festival which took place in downtown Brampton last fall, the musician called upon Council to work with arts groups equally and fairly, especially as it pertains to space requirements used by the various arts groups that are struggling to operate within the city. B-Jazzed was a recipient of a Community Grant provided by the City in 2017, and they are currently planning for a two-day festival in 2018, with a host of associated educational programs and events that complement the festival. Spada believes that there is a disparity of support for arts groups, with some receiving support directly from Council, while others are left competing in the Community Grant stream, which awards a portion of operating costs, puts restrictions on how awarded funds may be used, and does not include any allocation for use of space. Following the delegations, some members of Council wished to have an open discussion, but according to procedural rules, debate was not permitted at the committee without a report from staff. The City is currently putting the finishing touches on a Cultural Master Plan, with upcoming consultation sessions with the community and stakeholders scheduled to take place over the next two months. It is expected that the Cultural Master Plan will provide solutions to many of the challenges faced by arts groups, with a release of the document and a decision made by Council to be made later this year. Below, you can find the delegations made to Council by Sharon Vandrish and Carmen Spada. THEATRE ARTS: Sharon Vandrish, the President of Brampton Music Theatre, delegated to City Council about a concerning plan by the city to sell off a building that is currently being used by numerous art groups. The highly successful theatre company says that the loss of space will adversely affect the arts community, including her group, which is a major tourist and cultural attraction within #Brampton. ARTS SUPPORT is lacking in Brampton. Carmen Spada speaks passionately about the lack of support for all arts organizations in this city. Highway 410 approaching Queen Street. 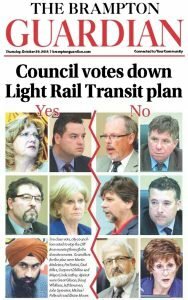 At Brampton City Council, members considered a plan put forward by the Association of Municipalities of Ontario to ask the provincial government to increase the HST by 1 per cent, up to 14 per cent, to help pay for infrastructure projects in this city and other municipalities across the province. Called “Local Share”, the sales tax increase would help close the $4.9 billion infrastructure gap that is facing Ontario cities and towns over the next ten years. A majority of municipalities have endorsed the plan which will be put forward to the Province. 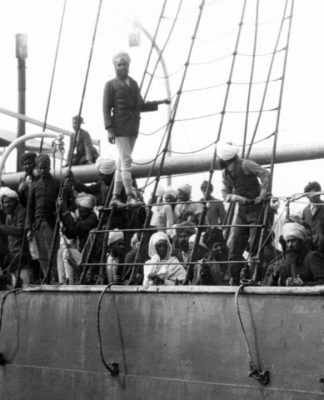 In an earlier version of this story, we reported that Brampton City Council had fully supported the plan, based on a proposed motion; However, in fact, a revised motion was presented and it was unanimously approved. In the revised motion, Council requests that the leaders of the three Provincial political parties provide their position on the Local Share initiative as proposed by AMO and/or propose alternatives for addressing the problem of financing infrastructure. The revised motion also stated that Council supports AMO in its efforts to secure this new source of revenue to help fund critical municipal services like roads, bridges, transit, clean water and other services. The Association of Municipalities of Ontario (AMO) is an organization of municipalities that works to support and enhance strong and effective municipal government in Ontario. It promotes the value of the municipal level of government as a vital and essential component of Ontario and Canada’s political system. AMO looked at over forty-four different “revenue tool” options, including property tax increases, increased land transfer taxes, vehicle registration fees, and an alcohol tax. 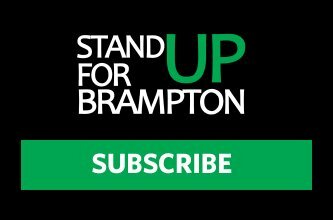 In a presentation made to Brampton City Council today, Matthew Wilson, a senior advisor for AMO, explained that the decision to support the increase to the HST was determined to be the best option since it spreads the cost of paying for infrastructure in cities across the broadest possible tax base, while reducing upward pressure on property tax bills. “It is a more predictable way of financing infrastructure at the local level.” Said Wilson. “The benefit is that it distributes the load over a much broader base, and its overall impact is diminished.” Wilson pointed out that visitors to Ontario would also be paying to support local investments. The plan is made against a backdrop of a province that is currently the most indebted non-sovereign government in the world, with a debt of $341 billion. Property taxes in Ontario are among the highest in the country, and AMO believes that a 1 per cent increase offers the most reliable and sustainable funding source to pay for infrastructure investments. Without this solution, there is a low likelihood of obtaining financial assistance from the Province, especially as elections take place every four years, and priorities for governments often change. The dollars would be collected provincially and redistributed to all municipalities based on an allocation formula. In the first year of implementation, the expected revenue would be approximately $2.5 billion, to be distributed to 444 municipalities across Ontario, with Brampton’s share being approximately $31 million, based on the proposed formula. 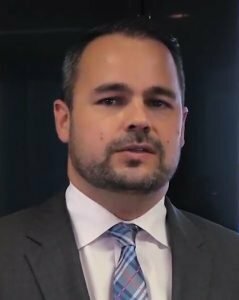 For a video presentation explaining the merits of the “Local Share” funding proposal presented by Matthew Wilson, Senior Advisor, Association of Municipalities of Ontario, click here. THIS STORY HAS BEEN UPDATED. Click here for the updated version. According to the Financial Services Commission of Ontario, a regulator appointed by the Province to regulate the auto insurance sector, insurance rates in the province have surged by 1% in the last quarter of 2017. Seventeen insurers representing approximately 40% of the market based on premium volume had rates that increased on average by 1.03% when applied across the total market. In Brampton, residents have long complained about paying the highest rates in Ontario. A recent study released by Kanetix.ca confirmed Brampton is tops in the province with the highest insurance rates at $2,268. Caledon has one of the lowest rates in the GTA at $1,164, even though they experience higher collision rates. This situation continues to affect Brampton residents despite promises by Provincial legislators to lower rates. choices made by the policyholder on coverage purchased and deductible or liability limits. The Financial Services Commission of Ontario suggests that consumers should shop around for auto insurance, reminding everyone that Ontario has a competitive marketplace. Rates for the same coverage vary based on each insurer’s claims experience and the insurer’s rating system. Did you like this article?  Stay updated on Brampton news and issues by following our Facebook page. Thank you. The future of arts in Brampton is in question. 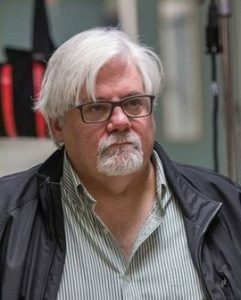 Charles Scott, a Brampton resident, filmmaker and patron of the arts, is sounding the alarm on behalf of the entire arts community in Brampton, saying that Brampton City Council is woefully underfunding the arts and risking the financial success of the businesses and quality of life of residents who call the city home. A recently approved budget by the City of Brampton offers little funding for the arts, and Scott blames Council for failing in their responsibility to the community. Arts funding in other cities has shown measurable economic benefits, often helping to revitalize urban areas, all while enhancing the cultural experience and improving citizens’ quality of life. With politicians always needing to balance budget constraints and pressure from residents who decry tax increases, Scott believes that the city needs to look at the big picture. Pointing out the recent $1.5 million given to the privately-owned Brampton Beast hockey team, Scott says that the city needs to balance its support for the community more effectively to ensure we get value for taxpayer dollars. “We’re paying $13,000 per home game, and there’s some kind of mystery marketing that we are getting out of it, and, as a citizen I don’t see it.” There is no marketing metric to measure the benefits of the Brampton Beast deal, and there has been no observable value shown to date. 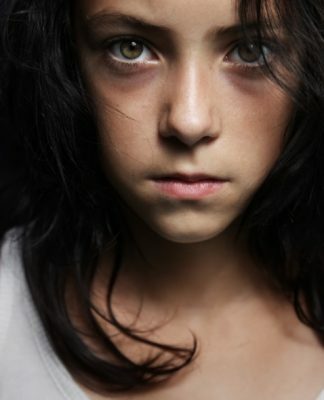 Over the past three years, the City of Hamilton has invested an additional $1.5 million into their arts community on top of previous funding, and the effects have been profound, with areas previously plagued by problems like vagrancy and issues related to drug and alcohol abuse, seeing increased use and new life. “Hamilton has changed completely,” says Scott. “The downtown of Hamilton is vibrant.” Scott points out that art galleries there are busy and the effects spill over into the rest of the city. “They get more people through the door on a Friday evening than probably come to an art gallery in Brampton in a year.” Over the next few years, Hamilton plans to invest an additional $500,000 every year towards arts and culture. 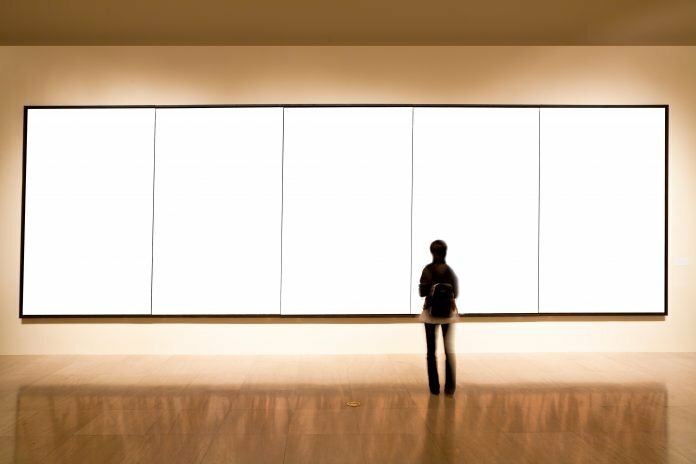 The fundamental question for policy makers becomes whether there is a real benefit to funding the arts community in Brampton, and a recent rash of restaurant closures in downtown Brampton may indicate that something is missing. See the full interview with Charles Scott below via Brampton Focus, with host Michael A. Charbon. 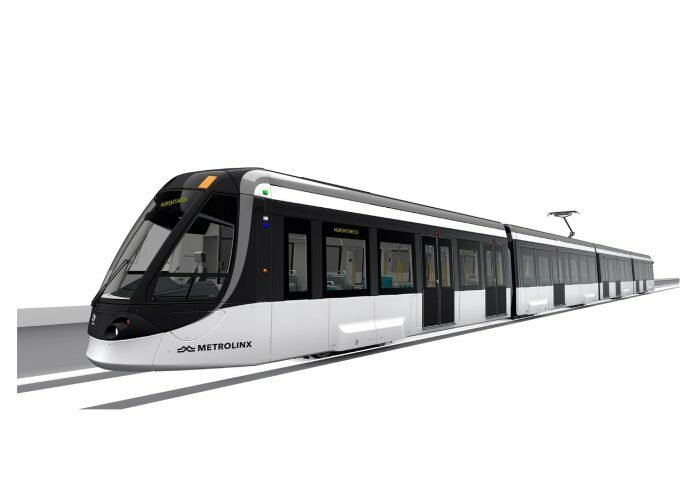 An image posted to the Hurontario LRT Twitter page has provided an updated look at the light rail vehicle (LRV) that will be used on the Hurontario LRT that will begin service sometime in 2022. 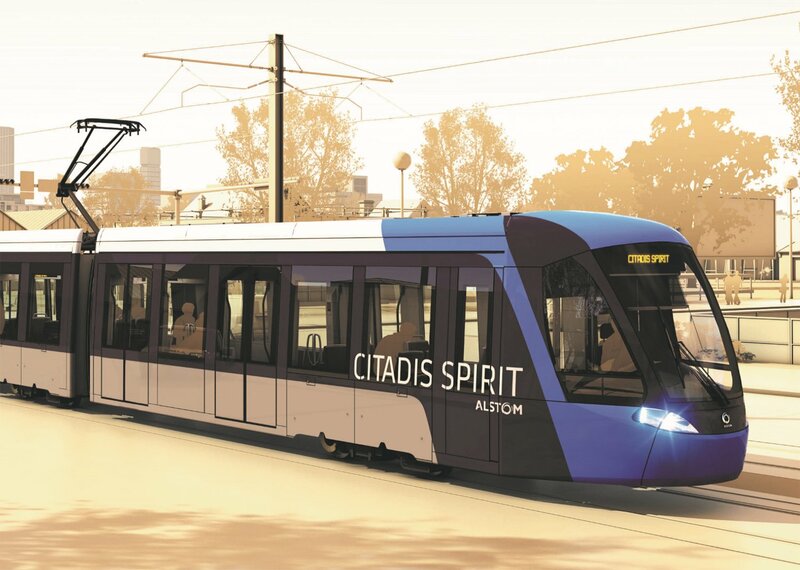 Metrolinx has chosen the Alstom Citadis Spirit light rail vehicles configured to carry 120 seated and 216 standing passengers, with a length of up to 157 feet, with a white and silver colour theme for the exterior. Currently, Alstom is the supplier of light rail vehicles for Ottawa’s Confederation Line, a light rail system built by that city at a cost of just over $2.1 billion, with a second phase planned that will push the final bill up to $5.1 billion. 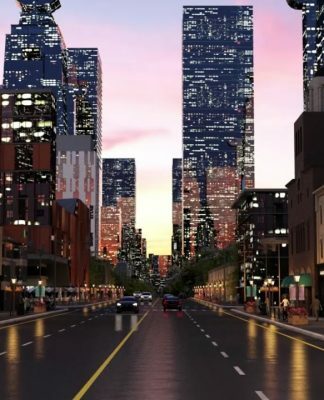 The costs for the project are being funded in part by the federal government and the province, while the City of Ottawa is funding a third, or $1.7 billion. In 2015, the City of Brampton considered a proposed plan to build the Hurontario-Main LRT from the Port Credit GO Train Station in Mississauga to the GO Train Station in Downtown Brampton. 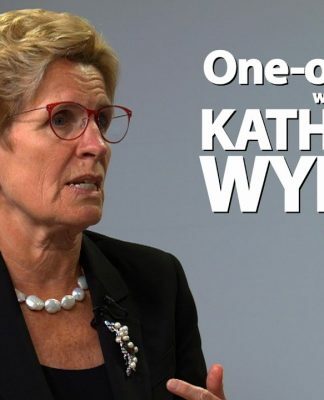 The plan was scheduled to cost a total of $1.6 billion, and the Province of Ontario had committed to paying the full amount. Following a marathon public meeting at the Rose Theatre where a majority of residents who delegated at the meeting spoke in favor of the project, Councillors voted against the plan, and instead chose to stop the train at Shoppers World. The decision resulted in the city looking at alternative unfunded routes, including an Etobicoke Creek route that was barred from moving forward after the Toronto Region and Conservation Authority voted down the idea, calling the plan “nuts”. The remaining route options lie along Kennedy Road and McLaughlin Road. Despite the fact that the other routes have already been studied and dismissed by experts, Council voted to spend another $4.4 million to initiate new studies that will require at least four years to complete. 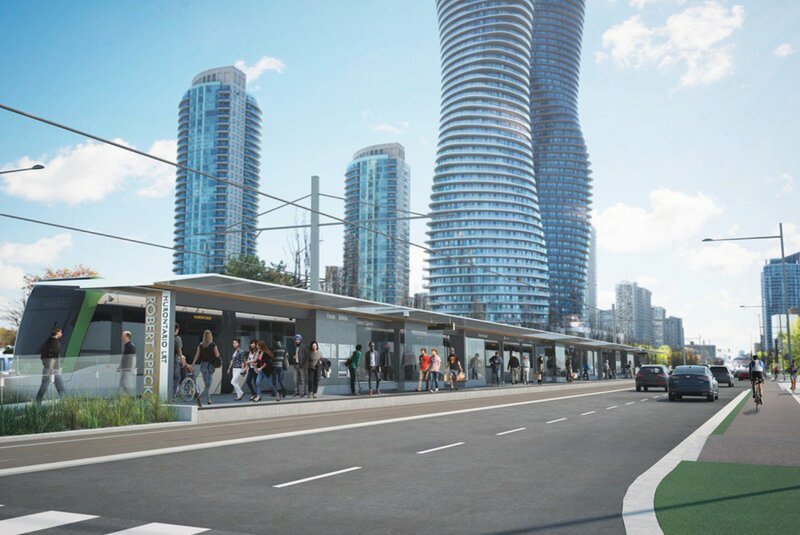 In the meantime, the City of Mississauga is forging ahead with its light rail transit system, and, from the look of the images they are sharing, Mississaugans will soon be enjoying a fast, efficient and fully paid transit line along their main corridor. In earlier concept images, Metrolinx had showcased an LRV model built by Bombardier’s rail division located in Thunder Bay, Ontario. However, Bombaridier has experienced challenges with delivery times for other projects like the Crosstown LRT which is being built in Toronto. Hurontario LRT stop in Mississauga. The Alstom trains feature a low-floor design that offers easy accessibility from the street or the curb, as well as an interior layout without steps or ramps to provide a safe and enjoyable experience for riders. 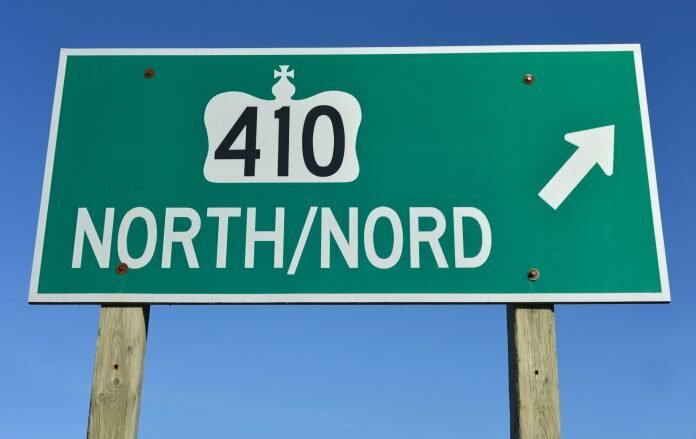 A 410 Highway sign which leads to Brampton. 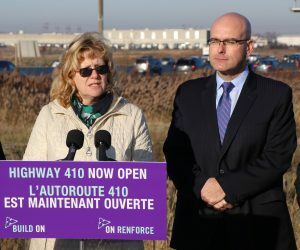 In a press conference with the highway as a backdrop, Steven DelDuca, the Minister of Transportation for the Province of Ontario, announced the official opening of two new lanes on the busy section of the 410 highway which connects Brampton to the 401 and 403 highways. The scope of the work includes building HOV lanes in each direction, seven bridge improvements, new ramps at the 401/403 interchange, new high mast lighting, carpool lots, and the planting of thirty thousand shrubs and three thousand trees along the route. Ontario is investing approximately $156.7 million in the project. The HOV lanes are expected to open next fall. The Mayor listed the numerous benefits that the city currently enjoys, including its close proximity to airports, the innovation supercorridor that connects the city to Waterloo and Toronto, and the new university that has been announced for the downtown area, all of which means that Brampton will continue to attract more people and jobs which will be well served by stronger roads and transit infrastructure. “Thank you for the early Christmas gift,” she added. Approximately 200,000 vehicles use Highway 410 every day. For years, residents in the city have been clamoring for improvements, citing long commutes and gridlock, especially during morning and afternoon rush hours. While the news of new lanes is likely to be welcomed by users of the road, some experts believe the advantages of more lanes will not be appreciated for very long. Induced demand is a well studied phenomenon that has led to highways like the Embarcadero Freeway in San Francisco being removed. Advocates suggest that less road building and a shift to an emphasis on building transit makes better use of scarce infrastructure dollars to offer residents alternatives to driving. 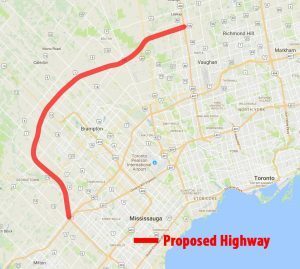 It’s that kind of thinking that put the brakes on another major highway project in Brampton, dubbed the “GTA West Corridor” or Highway 413, that has been proposed to be built to surround Brampton’s north and western boundaries, essentially forming a ring highway that connects Vaughn to Milton. 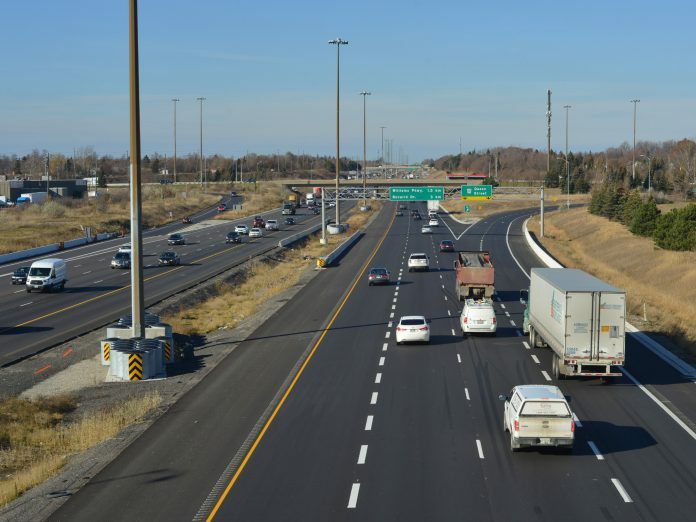 In December 2015, the Province announced a suspension of the environmental assessment for the GTA West Corridor project citing changing factors in transportation technology which necessitated a “rethink” of the project. A review panel has now submitted a report to the Minister of Transportation and an update on the future of the GTA West Corridor is expected in the upcoming months. The push for more transit options continues in Brampton, especially, where recent numbers reveal that transit ridership in the city has exploded by 17% in the past year. The City is planning to increase service levels by hiring additional drivers, purchasing at least sixty new buses, and announcing new service hours to meet the demand of over 27 million riders. In the meantime, Brampton is a logistical hub and also needs capacity for trucks and cargo. These added lanes will go a long way to ensure that the city can continue to meet the needs of both business and residents. New lanes added to the 410 Highway. Despite the rain, the Brampton Board of Trade Santa Claus Parade got off to a great start this weekend, with thousands of fans lining the route along Main Street. As the first vehicle in the parade, a classic 1974 Chevy Impala police cruiser, made its way down the parade route, the electricity cut out and left the street dark. The cause? Less than a kilometre away, a vehicle collided with a hydro pole, damaging a transformer which burst into flames, causing a mini-blackout to the entire area. If you were one of the thousands of people who stayed dry at home hoping to watch the parade broadcast live on Facebook, you were surely disappointed, since the power outage affected the broadcast transmission, cutting the live feed just as the parade began. Despite the outage, Santa’s TV elves were hard at work operating their TV cameras and hand-cranking their magic energy generators to keep the lights on, and, looking at the video below, it appears that they were successful. The blackout takes place at the 14-minute mark of the video below, with a light burst in the sky from the transformer explosion visible just a few seconds later. 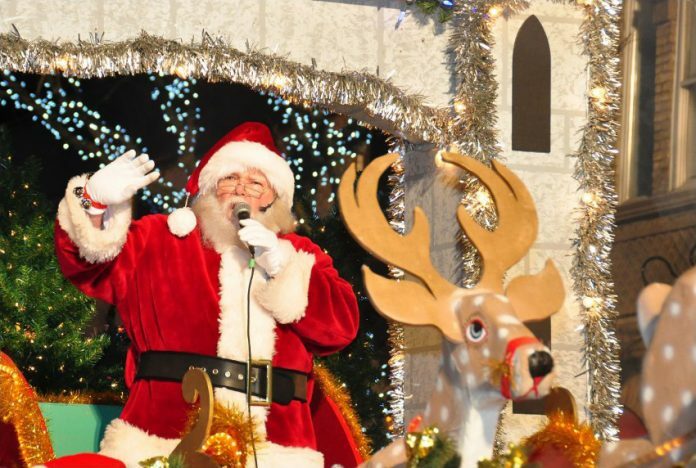 Enjoy the full broadcast of the Santa Claus Parade right here. Did you miss the Santa Claus Parade? No worries… Santa's TV elves worked through the rain and a huge power outage to capture every moment for you. Here is the complete parade broadcast! Enjoy! The Urgent Care Centre at Peel Memorial. On Thursday, Brampton was the site of an announcement on the future expansion of healthcare services in our city. Dr. Eric Hoskins, the Ontario Minister of Health and Long Term Care committed to add 37 new beds to Brampton Civic Hospital and to begin the process of development of Phase II of Peel Memorial Hospital. While the announcement did not include specifics, the news has been welcomed by Brampton residents as a step forward and a sign that the Province is finally listening to Brampton, a city that is seriously under-served when compared to others in the province. Speaking with Dr. Brendan Carr, the new President and CEO of William Osler Health System, about the announcement and commitment by the Province to build Phase 2 of Peel Memorial Hospital and add a total of 37 beds to Brampton Civic Hospital. The original Peel Memorial Hospital was closed down in 2007. Since its founding in 1925, it has undergone several renovations and expansions. In 2012, the facility was demolished to make way for the new Peel Memorial Centre for Integrated Health and Wellness at a cost of $530 million. 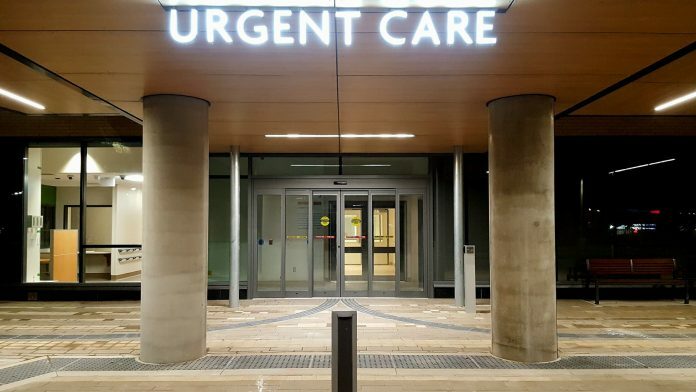 The new facility opened in 2017 providing an Urgent Care Centre for dealing with non-life-threatening conditions which alleviates pressure on Brampton Civic Hospital. Peel Memorial also offers day surgery services, as well as mental health, diabetes care, senior rehabilitation and dialysis services to the residents of Brampton. 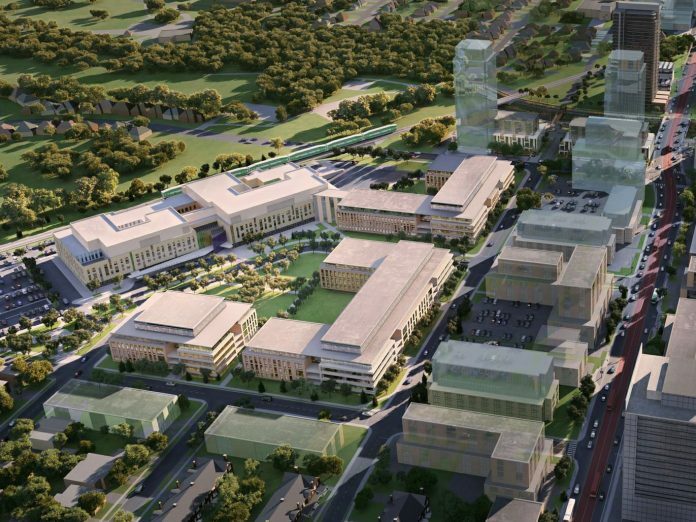 The Province has announced it will build the second phase of Peel Memorial, effectively making the facility a full hospital, as well as committing to open an additional 37 beds at Brampton Civic Hospital in the next few weeks. Dr. Eric Hoskins, the Minister of Health and Long Term Care for the Province of Ontario, stood before a group of invited guests, including Brampton Mayor Linda Jeffrey and former Ontario premier Bill Davis, to say that the Province would add 31 beds to the previously announced 6 beds at Brampton Civic Hospital, and that they would be in operation before the start of the holiday season. “Together, these 37 additional beds are going to help reduce wait times in the hospital, helping patients get faster access to care, and these 37 additional beds will all be opened in a matter weeks and before the holiday season.” Hoskins said. Following some applause, Hoskins then made the statement that many of the people assembled were hoping to hear. PEEL MEMORIAL Phase 2 is announced! Watch as Dr. Eric Hoskins, the Ontario Minister of Health and Long Term Care, announces that the Province will build the second phase of Peel Memorial, in addition to opening 37 new beds at Brampton Civic Hospital. 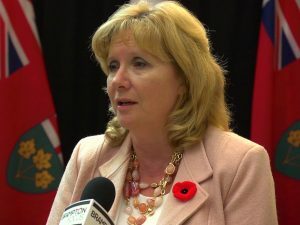 The announcement comes on the heels of a briefing note that was uncovered by the Provincial NDP which revealed 4,352 patients were cared for in the hallways at Brampton Civic Hospital between April 2016 and April 2017. Surge pressures at the Brampton facility have pushed occupancy rates to 114 per cent above capacity. “Code Gridlock”, an emergency status, was declared eight times for a total of 65 days between January to April 2017. During these times, patients would stay in the emergency department up to four days waiting for a bed. The emergency department at Brampton Civic was originally built to serve 80,000 visitors annually, but now sees 138,000 every year. This high demand has caused over-crowding and resulted in the opening of unfunded beds, with patients being placed in hallways. The news, spreading on social media and other traditional media outlets, galvanized the community with people demanding change from Queen’s Park. With 37 new beds being funded and allocated at Brampton Civic, wait times are now expected to improve. The construction and opening of a “full” Peel Memorial Hospital will be a long awaited next-step in the building of healthcare delivery for Brampton, a city which is one of the fastest growing cities in Canada. Phase II of Peel Memorial is expected to add more inpatient services, including for patients with complex continuing care needs, and rehabilitation services for patients and families. “It will have well over a hundred new beds, and an investment from the government of hundreds of millions of dollars,” noted Hoskins, adding that the facility will be a tower located on the northeast corner of the property. No dates or timelines were presented in today’s announcement. Peel Memorial Hospital was closed down in 2007. At the time, the facility offered 360 acute care beds. The hospital employed over 1,800 professional and support personnel. There were 320 physicians as well as approximately 600 volunteers that contributed their services and fund raising efforts. Over its long and storied past, it has undergone several renovations and expansions since its founding in 1925. In 2012, the facility was demolished to make way for the new Peel Memorial Centre for Integrated Health and Wellness at a cost of $530 million. The new facility opened in 2017 providing an Urgent Care Centre for dealing with non-life-threatening conditions which alleviates pressure on Brampton Civic Hospital. Peel Memorial also offers day surgery services, as well as mental health, diabetes care, senior rehabilitation and dialysis services to the residents of Brampton. Please enjoy this historical perspective of the evolution of Peel Memorial. AMAZING NEWS! Peel Memorial is back. It has been a long road, and it's a story worth telling. Please share with your friends and neighbours.